Is Calgary's City Centre going to pot? It certainly looks that way as dozens of cannabis stores could be coming to Calgary's City Centre this summer. The City of Calgary received 226 cannabis store applications on the first day of accepting applications, most in the first 17 minutes. 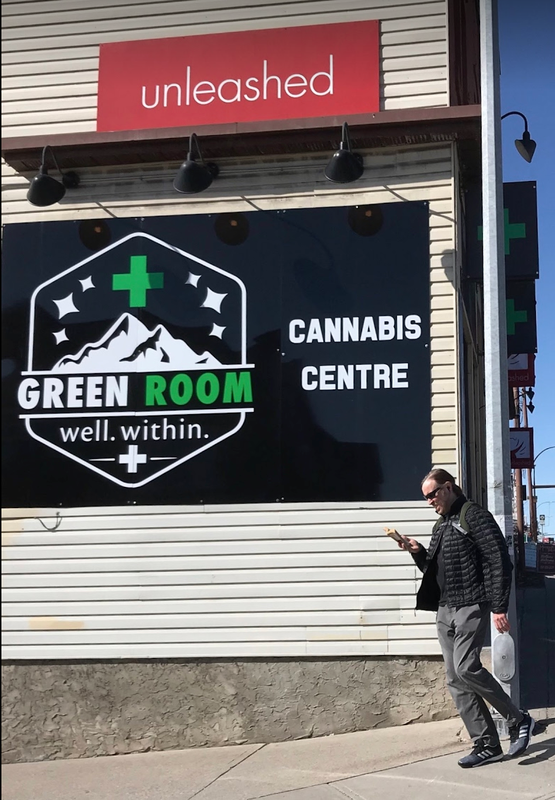 Cannabis Centre on 14th St. SW located between the South Calgary and Elbow Park communities. Michael Kehoe, founder of Fairfield Commercial Real Estate, who has been leasing retail space in Calgary for over 35 years has never seen anything like it. Kehoe has already nicknamed Inglewood as “Ingleweed” as its High Street (pun intended) as Ninth Avenue SE could have as many as six cannabis stores. Fifteen applications were made on or near 17th Ave SW, which might result in the RED Mile being rebranded the Weed Mile. The City is looking at seven applications in Kensington and five in the Marda Loop business district. The Red Mile will become the Weed Mile this summer as perhaps as many as a dozen "pot shops" open on or near 17th Ave SW. (source City of Calgary website). When it comes to store fronts and pedestrian friendliness, the “pot shops” will probably be all over the map. Some may be like seedy “peep shows” with windows covered up and a buzzer at the front door to get in. Others are expected to be more highbrow (there is that pun again) with attractive storefront windows and welcoming entrance. After all, there is nothing illegal happening here. Kehoe thinks, “as cannabis retailing become mainstream, it will create an entire new category of retailing. 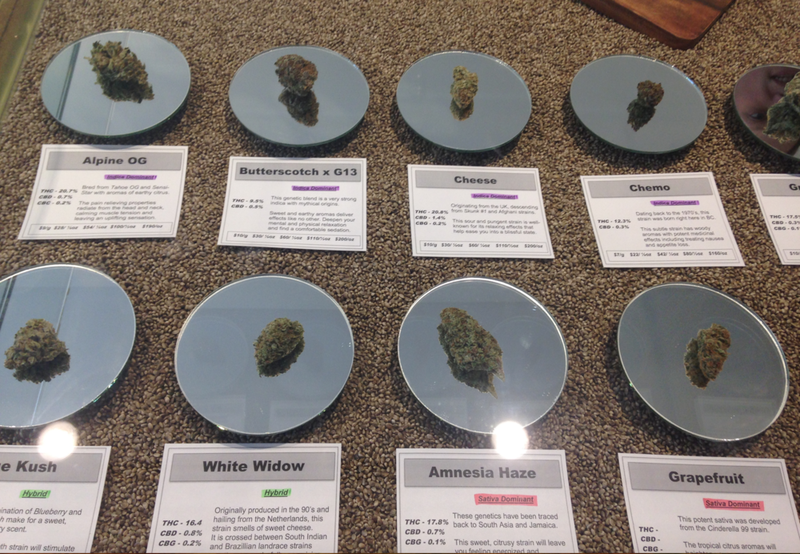 It will be interesting to see the approach the cannabis retailers take with the design and marketing of their stores. Nelson BC's main street cannabis shop. That being said, retailers are prohibited from operating within 150 meters of a school, 10 meters of a daycare and 300 meters from each other. Similar restrictions exist for liquor stores. A few years back, we travelled to Nelson BC, Pot Capital of Canada, perhaps North America. They already had a pot shop on their High Street. It was very attractive. It was like going into a high-end (there is that pun again) jewellery store. 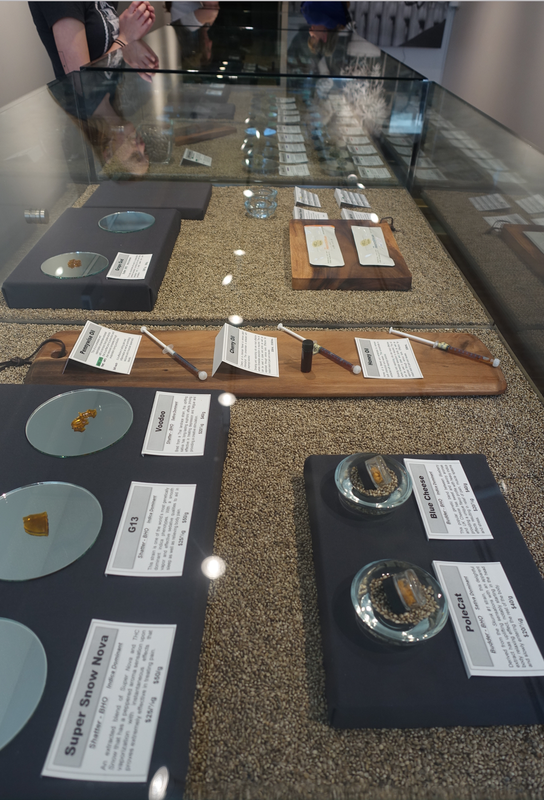 The fifty or so samples of the different cannabis options were attractively presented in glass cases with a description and price. It wasn’t seedy at all. However, it wasn’t like Costco i.e. no free sample here. Nelson's cannabis shop's product presentation was very attractive and informative. No licences will be approved until after the Federal government announces a firm date for legalization, which is expected to be August or mid-September. However, if it is anything like the Trans Mountain Pipeline (could be another pun here) fiasco, who knows when the approval might actually happen. Kensington will not be left out of the "pot shop" invasion. Marada Loop will also get its fair share of "pot shops." The Beltline's Design District will take on a new look with perhaps seven "pot shops." Interestingly; Quebec is allowing only 15 cannabis stores province-wide this summer, Ontario only 40 and Saskatchewan 51 (they had 1,500 applications). Alberta will have no limit on the number of cannabis stores, however, no company can own more than 15% of the stores. Stores will be able to be open 10 am to 2 am (same as liquor stores), with local municipalities being able to adjust the hours. It is expected Calgary could have as many as 250 stores by the end of 2018. The City Centre could easily have 30+ stores, with additional applications for “pot shops” in Calgary’s downtown, along Centre Street and in Bridgeland. They will add a new dimension to the City Centre shopping experience. Yes, it looks like Calgary’s City Centre could be going to pot! No, I haven’t heard anyone proposing to convert some of the empty downtown office space into cannabis farms, but I wouldn’t put it past some enterprising entrepreneur to be looking at the feasibility. Nelson: Fun, Funky & Quirky!